Individuals requiring the services of police, fire or ambulance only need to dial 9-1-1. The Regional District of Fraser-Fort George provides 9-1-1 services to all municipalities and electoral areas of the Regional District of Fraser-Fort George, Cariboo Regional District, Regional District of Bulkley-Nechako and the Regional District of Kitimat-Stikine. The 9-1-1 service area covers 241,111 square kilometres. 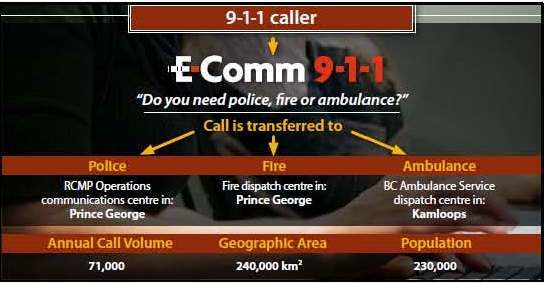 9-1-1 calls are first answered by E-Comm Emergency Communications for British Columbia Inc., (“E-Comm”). E-Comm in turn, transfers the caller to the emergency response agency the caller requests. Police, fire and ambulance operators located in Prince George and Kamloops manage the 9-1-1 call from that point forward, including the dispatch of emergency responders. The 9-1-1 Emergency Service provided by the Regional District of Fraser-Fort George also includes fire/rescue radio dispatch and communication services. The Fire Operations Communications Centre located in the City of Prince George Fire Hall No. 1 dispatches more than 79 fire/rescue agencies located within the 9-1-1 service area.